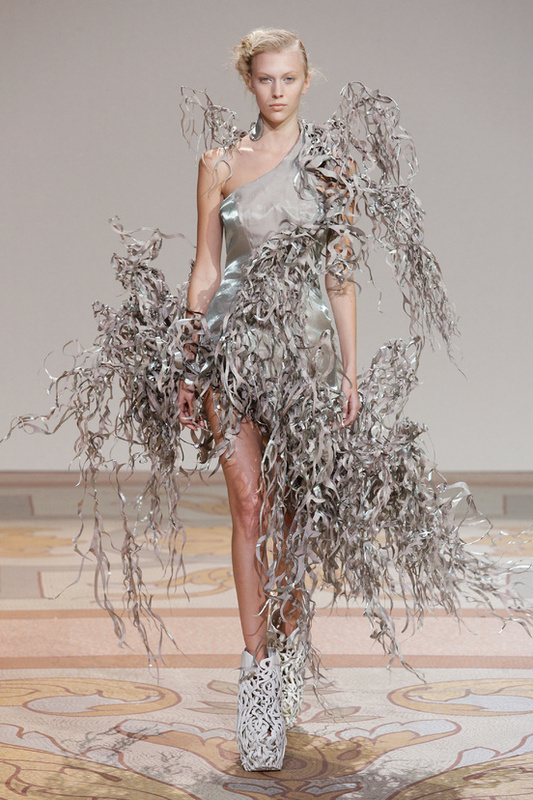 Steve Gschmeissner’s photographs, using Scanning electron microscope (SEM) technology, influenced the Iris van Herpen Couture Spring/Summer 2012 Show, titled « Micro ». 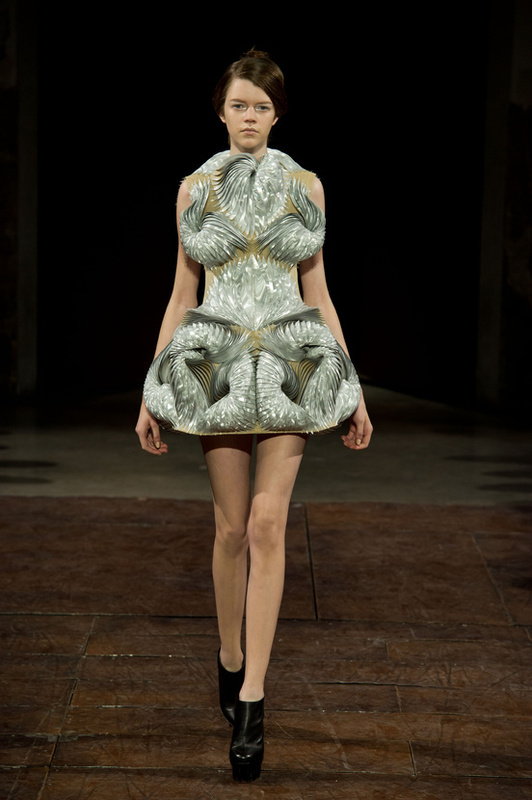 Ancient Egyptian mummies inspired the Iris van Herpen Autumn/Winter 2009-2010 Show, « Mummification ». Other Egypt-inspired collections : Alexander McQueen Autumn/Winter 2007-2008 (ancient Egypt was one of the references of this show), Christian Dior by John Galliano Couture Spring/Summer 2004 (this collection paid homage to ancient Egypt), Empires Spring/Summer 2009 (this collection was partly inspired by Napoleon’s French Campaign in Egypt), John Galliano Autumn/Winter 1997-1998 (titled « Suzy Sphinx », this collection was partly influenced by Egypt), Miguel Adrover Autumn/Winter 2001-2002, Preen by Thornton and Bregazzi Spring/Summer 2011 (this collection was an homage to the play of light and shadow on Egyptian architecture), Rick Owens Autumn/Winter 2011-2012 Menswear (this collection was partly based on the ancient Egyptian slaves who built pyramids), Sophia Kokosalaki Spring/Summer 2009 (this collection drew inspiration from ancient Egyptian costumes), Topshop Unique Spring/Summer 2012 (the theme of this show was « ancient Egypt meets ’90s hip-hop scene »), Zero + Maria Cornejo Resort 2014 (for this collection, Maria Cornejo thought about being in places of North Africa, such as Egypt). Philip Beesley’s « Hylozoic Ground » project, presented in the Canadian Pavilion of the 2010 Venice Biennale in Architecture, influenced the Iris van Herpen Couture Autumn/Winter 2012-2013 Show, titled « Hybrid Holism ». Moreover, Philip Beesley has cocreated some pieces of the Iris van Herpen Couture Spring/Summer 2013 Collection, titled « Voltage ».